Arjun Kapoor who was all set to visit a suburban college today for the promotion of his film Finding Fanny could not make it to the college. 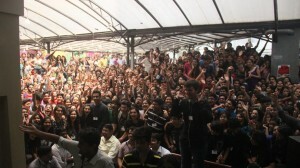 We hear there were over 7000 college students who had gathered to catch a glimpse of their favorite youth icon Arjun Kapoor. Even the fans had gathered on the street and due to security reasons, Arjun could not make it to the college. He wanted to be a part of it, but because of the over whelming response that he received, Arjun could not make it as the crowd had gone berserk, and due to security reasons the college visit was called off!